Although there is some overlap of habitats with alligators and crocodiles, it is rare to see both together. The best way to tell the difference between the two animals is by checking the size and head: Crocodiles are slightly smaller and less bulky than an alligator. In addition, the crocodile has a larger, narrower snout, with a pair of enlarged teeth in the lower jaw that fit into a “notch” on each side of the snout. The alligator has a broader snout, and all the teeth in its upper jaw overlap with those in the lower jaw. 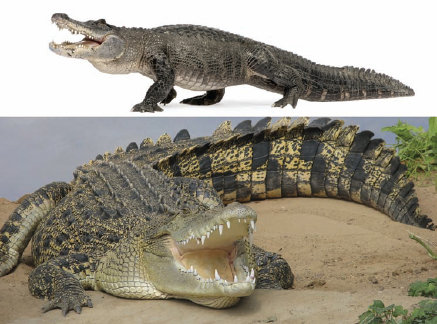 Both crocodillians, an alligator (top) has a number of physical characteristics that are different from a crocodile (bottom), including the shape of the snout, arrangement of teeth, and body size (iStock).